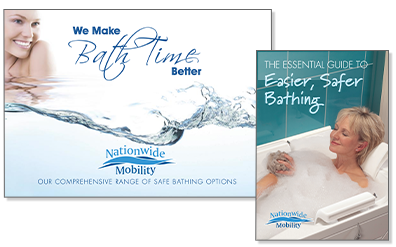 Choosing a Bath Lift from Nationwide Mobility couldn't be simpler, you can even try one in the comfort of your own home so you choose what is best for you. Do you struggle to get in and out of your existing bath but don’t want the upheaval and expense of replacing it. If so the Bathmate could be the answer for you. The bathmate simply fits inside your existing bath and at the press of a button lowers you safely to the bottom of the bath and back up again. 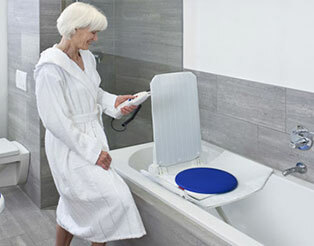 A tried and trusted product and with over 40,000 sold in the UK the Bathmate is one of our most popular bath lifts. The wall mounted Mermaid bathseat allows you to take an entirely effort free bath without the need for any major alterations to your bathroom. Just sit on the belt and the you will be gently lowered right to the bottom of the bath. After enjoying your bath just press the button and you will be lifted effortlessly up and out again. Fitted with the minimum of fuss, usually within an hour . The Aquatec Orca is ergonomically designed to fit into your own bath without requiring any fixed installation. The Orca is particularly suited to customers who want a stable easy to use bath seat and features a reclining back to ensure maximum comfort and safety. The Orca is operated by an easy to use hand control. 0800 316 0116 and one of our friendly advisors will be happy to help you.